As we approach the 150th anniversary of the Emancipation Proclamation, I thought a little background might be useful in understanding this important milestone in U.S. History. I have divided the following information up into numbered sections, simply for ease of reading. The Emancipation Proclamation was an executive order issued by Abraham Lincoln in late 1862, scheduled to take effect on January 1, 1863. As an executive order, the Emancipation Proclamation was not a law, but an order issued under the Constitutional powers of the president. It sought to free slaves in areas that were then in rebellion, and made a precedent for using those freed slaves as soldiers in the Union cause. Although Lincoln privately asserted that he personally wished to see an end to all slavery, his public position on slavery was never an abolitionist one. On the contrary, he expressed his belief that the federal government did not have the legal right to outlaw slavery in the states, and said, instead, that his only goal was to keep slavery from spreading outside those states where it already existed. In his first inauguration speech, in 1860, he stated emphatically: "I have no purpose, directly or indirectly, to interfere with the institution of slavery in the states where it exists. I believe I have no lawful right to do so, and I have no inclination to do so." Despite misconceptions to the contrary, the Emancipation Proclamation did not actually outlaw slavery, or free all the slaves. It only freed those people who were slaves in territories that were in rebellion against the United States as of January 1, 1863. 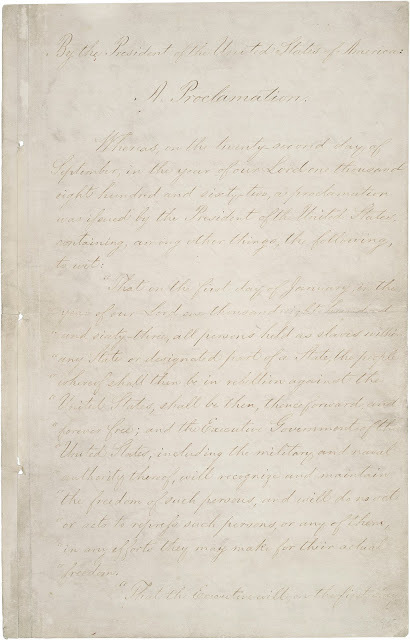 As such, the Union slave states of Kentucky, Delaware, Maryland, and Missouri were exempted from the order, and their slaves would not be freed until they did it themselves (Maryland in 1864 and Missouri in early 1865) or until after the war and Lincoln's death, with the passage of the 13th Amendment in December, 1865 (Kentucky and Delaware). It also did not affect slaves in regions of the Confederacy that had already come back under U.S. control (such as Tennessee, parts of Virginia, and the area around New Orleans). Overall, nearly a million slaves (about 25% of the total) were exempted from the proclamation, and thus legally remained in slavery. In light of Lincoln's insistence that he had no intention of ending slavery, why did he change his mind and issue the Emancipation Proclamation? Quite simply, it served two political purposes: first to threaten the Confederacy, then to punish it. The proclamation was issued in September, 1862, and stated that any area still in rebellion as of January 1, 1863, would have its slaves permanently and irrevocably freed. As such, it served as a threat. The threat didn't work, however; no states or territories within the Confederacy returned to the Union. As such, when January 1 rolled around, it became a punishment: you have rebelled against the United States, so you will be punished by having your slaves freed as our armies move through and subdue your territories. Since slaves were legally only property, they could be confiscated as part of the normal course of a war. It's interesting to speculate about what might have happened if the states of the Confederacy had actually bowed to the threat of emancipation. What if the rebellious southern states had put down their weapons and returned to the fold before the January 1 deadline? Slavery certainly wouldn't still exist now, in the 21st century, but it may have carried on for several more decades than it actually did. Despite this, there can be no question that Lincoln's true motivation was not threats or punishments at all, but actually ending slavery. There is also virtually no doubt that he never expected the "threat" to work; he surely didn't expect the rebellious states to drop their weapons and hang their heads in submission. 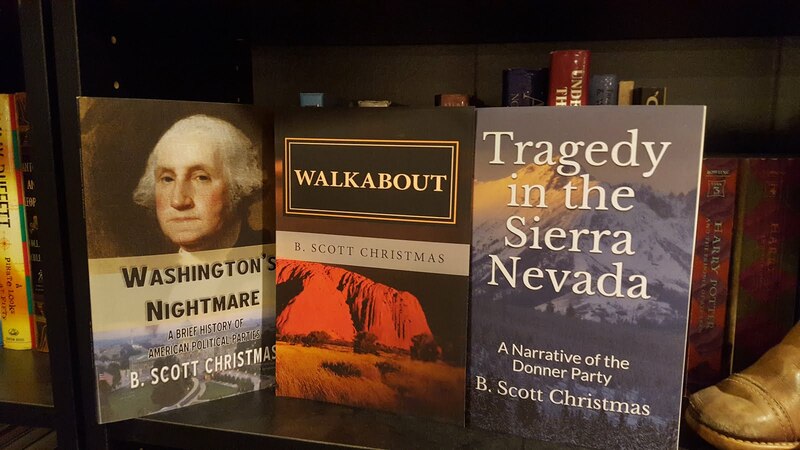 He had always publicly stated his opposition to abolition, on Constitutional grounds, but the war gave him an opportunity to get around the normal limits of the Constitution and ultimately end what he viewed as the immoral institution of slavery. So how, exactly, did Lincoln achieve this? After all, he had said himself, just two years earlier at his inauguration, that he had no legal right to free slaves. So how did he justify his actions? There is positively no question that the U.S. Constitution, in 1862, did not give the federal government the right to interfere with slavery in the states. The 10th Amendment states that any power not expressly given to the federal government in the Constitution automatically becomes a right of the individual states. Therefore, since the power to control slavery isn't given in the Constitution to the federal government, it must by default be a state's right. This is why Lincoln, and most everyone else, never embraced abolition as a legal right of the federal government. It was unquestionably a state's right. But because the South had rebelled and was now at war with the Union, Lincoln could use the excuse of hastening the war's end by taking actions aimed at ruining the economy of the enemy - in this case ending slavery. Many people throughout the Union, and particularly in Congress, had argued that ending slavery would decimate the South's economy and thus bring an end to the war. This, then, is how Lincoln justified the Emancipation Proclamation from a legal standpoint. He argued that hastening an end to the war through economic ruin was necessary to preserve the Union. He further argued that since the president is the commander-in-chief of the U.S. military, he has the Constitutional right and responsibility to do whatever he deems necessary to achieve a military victory, particularly when it affects the very preservation of the Union. Remember that the Constitution charges the president with the duty to "preserve, protect, and defend" the Constitution, and Lincoln saw preserving the Union as his primary duty as a wartime president. One argument that Lincoln could not make, and which no doubt caused him more than a few nights of fret, was that he had the right to end slavery because the Confederacy was not part of the United States. Normally, if a country is at war with another country, and intends to overtake and rebuild that opposing country, setting up military rule and suspending the old civil laws is typically fair game. This is what the Allies did in Germany in World War II, and what numerous other nations have done in wars throughout history. So Lincoln might have argued that he had the Constitutional right to free Confederate slaves simply because the Confederacy was a foreign nation that the United States was at war with. Anything goes, as it were. Lincoln would no doubt have loved to make this argument. But he couldn't, because he had spent the first two years of his presidency arguing vociferously that secession was not legal to begin with, the Confederacy was not a legal or legitimate nation, and the states comprising the Confederacy were still part of the "perpetual union" of the United States. This, in fact, had been his entire justification for waging war against the southern states in the first place: they had seceded illegally, were thus in open rebellion against the Union, and the federal government thus had the right and responsibility to subdue them and bring them back into the fold. With that in mind, he couldn't now turn around and claim that he had the right to free the slaves based on the fact that the Confederacy was a foreign nation and the U.S. was not obligated to recognize its laws. That would have been a "flip-flop" and it wouldn't have sat very well with his supporters, his generals, or his soldiers dying in the fields to preserve the Union. It's probably fair to say that the Emancipation Proclamation was unconstitutional. That may sound shocking to a lot of people, but it was a common perception and criticism at the time. Anti-war sentiment was very common throughout the North, especially in the first few years of the war. Many people believed that the best way to end slavery in the United States was simply to let the slave states secede and go their merry way; that slaves weren't worth fighting a war over; that as long as slavery didn't expand from those states where it already existed, it wasn't a big deal. Today we imagine a Union united behind the cause of freeing the slaves, but the fact is that the primary impetus for Union soldiers to fight wasn't freeing slaves; it was preserving the Union. With the exception of the abolitionists, who represented just a small percentage of the whole Union population, most people didn't really have a problem with slavery continuing in the South. Most people figured it would eventually die out on its own, and there were even political movements to give federal aid to states that voluntary repealed their own slavery laws. So there were many critics of the Emancipation Proclamation when it was enacted, and some of their criticisms, from a purely Constitutional point of view, were probably valid. No one, of course, questions the ethical and moral rightness of the document. But if we look, for a moment, at the Emancipation Proclamation the way a Supreme Court justice might look at it, we're forced to accept the possibility that the entire thing was unconstitutional. I've already provided Lincoln's own justification for issuing the proclamation. If that passage sounded like a lot of legal mumbo jumbo and hair-splitting, that's because it basically is. The Constitution makes the president the commander-in-chief of the military, but it also assumes that the president will be commanding the military against foreign enemies, not internal ones. And aside from giving the president this broad power, the Constitution is mute on what, exactly, the president can do as commander-in-chief. Hire and fire generals, certainly. Make military decisions during times of war, absolutely. But the actual power of waging war and conducting war belongs to Congress, not the president. It is highly questionable whether Lincoln, in his capacity as commander-in-chief, actually had the constitutional right to issue the Emancipation Proclamation. His justification was, in my opinion, on very shaky legal ground, and probably overstepped his constitutional powers. Even if we accept that Lincoln had the legal power to issue the proclamation, as part of his wartime powers, there is almost no question whatsoever that the wording of the proclamation itself was unconstitutional. The key phrase comes in the very beginning of the text: "[Beginning January 1, 1863], all persons held as slaves [within the Confederacy] shall be then, thenceforward, and forever free." In other words, the proclamation isn't vague at all: as of January 1, 1863, slaves held in any territories rebelling against the Union will not just be freed, but will be forever free. The problem here is that even by Lincoln's own justification, this proclamation was issued as part of the presidential war powers. As such, it could only be understood to be in effect as long as the war continued. Once the war ended, the order could no longer be in effect - meaning that the proclamation didn't actually have the legal authority to declare slaves freed under its powers as "forever" free. 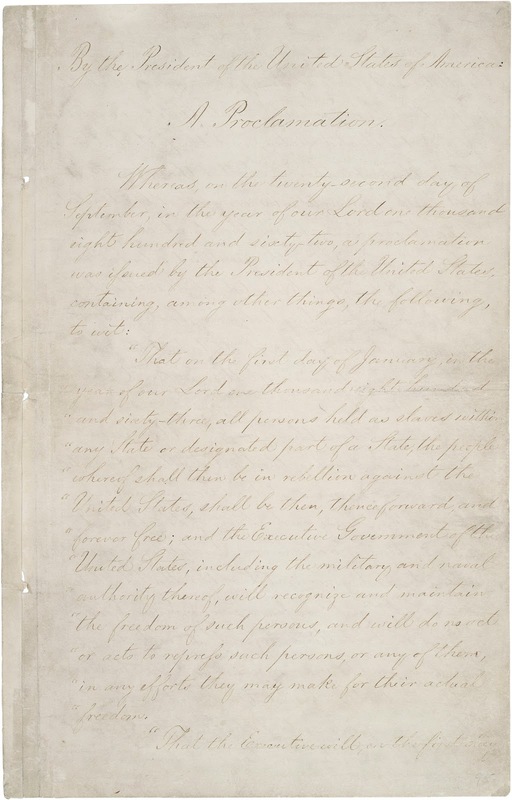 The fact is that if so much of the country had not been focused on waging and winning the existing war, it is a very good possibility that the Emancipation Proclamation might have been challenged in court, and it is difficult to say with any degree of certainty that it would have been upheld as legal. In the end, the Emancipation Proclamation is one of the most important executive orders ever issued by any president. It was radical, it was provocative, and it might even have been unconstitutional. But it undoubtedly gave a new focus to the war and a new expectation of the war's outcome and ultimate purpose. Yet, at the same time, it was in many ways very limited. It did not end slavery. It left nearly 25% of existing slaves in servitude. It did not make the practice of slavery illegal. It did not have any authority beyond the war itself, or upon any part of the U.S. not currently in rebellion as of January 1, 1863. Upon its initial implementation, it hardly affected any slaves at all - the slaves that would eventually be freed by it would not be freed until the Union armies reached them, which in many cases would be many months, and even years, later. As one critic has cynically pointed out, the only slaves it freed were those in areas not controlled by the Union - in other words, the enemy is not allowed to have slaves, but we'll keep our own. Despite this, it is hard to underestimate the importance of this provocative historical document, and the impact is has played on racial issues in the United States for the 150 years since it was enacted. This photograph was taken in early October, 1862, just a few weeks after the Emancipation Proclamation had been issued, to take effect the following January.